An update on Harvey Mitchell (ca. 1800-1863/64) and his family. I've come to the conclusion that all of the immediate family was living together in Washington, D.C., in 1860, including Mary Louisa (Louise) Mitchell and her recently acquired husband, John Milton Binckley (alternately Binkley). Occam's razor led me to this conclusion, and after I reviewed scans of the original census sheets, I saw that both institutional transcriptions and indexing were off, leading me astray initially. It's still a mystery as to what happened to Harvey Mitchell during the American Civil War, and how or where he died. However, John Milton Binckley, who was listed as a clerk in the 1860 census, became Assistant Attorney General of the United States effective June 1, 1867. Also, between 1860 and 1870, Jane Wood Johnston Mitchell (Harvey's wife, sister of Joseph Eggleston Johnston) altered her last name to Michel. Whether Harvey Mitchell had done this also, I do not yet and may never know for sure. By 1870, Jane Michel (i.e. Jane Wood Johnston Mitchell/Michel) was listed, or so it appears, in two places: Abingdon, Virginia, where she's listed as a school teacher, living very near other Johnston relatives; and in Norfolk, Virginia, living with John Milton Binckley ("attorney"), Mary Louisa/Louise Mitchell/Michel Binckley, and their kids at the time: Nellie and Henry (or Harry) Binckley, both of whom had been born in Washington, D.C. Another kid, George Sydney Binckley, would be born in Norfolk on September 9, 1870. Several decades later, Mary Louisa/Louise Mitchell/Michel recalled living with her parents and siblings in Washington, D.C. prior to the Civil War. “We lived on the north side of Massachusetts Avenue between Eleventh and Twelfth Streets.” -- John B. Larner, “Some Reminiscences of Mrs. John M. Binckley of Early Years in Washington” (Presented to the Society, March 15, 1927) Records of the Columbia Historical Society, Washington, D.C., Vol. 29/30 (1928), page 344. “We went to school in Georgetown, at what is now called the Colonial Apartments.” This would have been the daughters only, attending Miss Lydia English’s Young Ladies Seminary (aka Georgetown Female Seminary*) at 1305-1315 30th Street, NW. During the Civil War, it was repurposed into a Union hospital; it seems Miss Lydia English was pro-Confederate and denuded of her school. If I'm not mistaken, Walt Whitman came here often during the war. “In very bad weather we went in a carriage, usually that of the Farnhams, with their old Irish coachman, but on good days we thought nothing of the walk, nor did any one [sic] else. Walking was almost the only way to get anywhere in those days . . . The mud was awful. Cows roamed the streets at will, and a great many people felt quite unashamed of keeping a pig or so where their grounds allowed it” -- page 347. “My brother [William Manning Mitchell/Michel, ca. 1840-1908] used to shoot snipe in what was called ‘The Slashes’ (mysteriously named to me now)** and roamed the wilds from P Street out with his gun and dog in great freedom” -- page 348. *One promising place to search for more details about this place and its students would be: Catalogue Of The Members Of The Female Seminary, Georgetown, D.C.: For The Year Ending ... With The Terms Of Admission ... Washington, D.C.: Printed by J. and J.S. Gideon, [184-]-, 8 vols., Huntington Library, Art Collections & Botanical Gardens, San Marino, CA. ** Dupont Circle and vicinity. 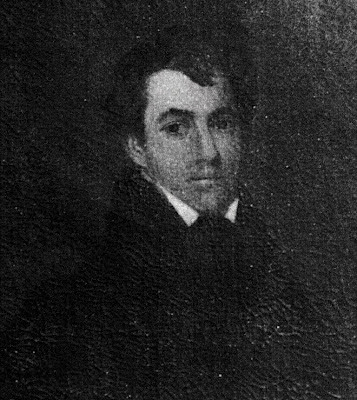 Cropped portrait of Dr. Edward Porcher (ca. 1814-1874) at top: scan of a photocopy sent by Arielle Doriester, Reference Associate, Frick Art Reference Library, The Frick Collection, New York, NY, February 17, 2012.